Livpure Pep Star Review: Livpure Pep Star RO water purifier is equipped with a 7 stage water purification process along with UV + UF and a taste enhancer that makes it a wholesome choice for your home. We’ve got our hands on the Livpure Pep Star RO water purifier and here’s an in-depth review. Build: Livpure Pep Star RO is made with food grade, non-toxic, engineering grade plastics. Such plastic is considered nontoxic and BPA free, this keeps the water bacteria free even when stored for longer duration. The device weighs less than 9 KG’s, thanks to the high quality materials used. Outer body is ergonomically built and sealed to prevent any visible clutter of pipes or wires. Livpure Pep Star looks sleek and tall measuring 297(W)X257(D)X506(H) in mm and the device can handle input voltage between 140 to 300 V AC which can keep your investment safe from voltage fluctuations. The popped out water faucet feels delicate that gives you an impression it can break soon. Technology: Livpure Pep Star RO water purifier has an advanced 7 stage purification technology that includes RO + UV + UF purification methods and a water taste enhancer. 6 or 7 levels of purification should not be the deal breaker as these are just marketing tricks, the purified water is safe as long as the device is free from ozone and is equipped with RO +UV purification technology including a pre filter. 1. Sediment Filter: Sediment Filter removes coarse and fine suspended dirt impurities from water. 2. Pre Activated Carbon & Absorber: It adsorbs residual chlorine and hazardous impurities like pesticides, herbicides , THM’s etc. from water. It also adsorbs bad taste, color and odor causing organic compounds from water. 3. Antiscalant Filter: The Antiscalant Filter chelates scale causing salts in water to prevent scaling on membrane layers. It results in improved purification capacity and increased life of membrane. 4. Reverse Osmosis (RO) Membrane: The water is passed through RO membrane at high pressure, RO Membrane removes Bacteria, Virus, Protozoa and reduces Dissolved Salts, Hardness, Pesticides and heavy metals from water like Arsenic. 5. Ultra Violet (UV) Disinfection Column: Ultraviolet radiation disinfects the water from water borne disease causing bacteria, virus and protozoa, thereby making it microbiologically safe to drink. 6. Ultra Filtration (UF) Cartridge: Effectively removes Bacteria, Giardia, Cysts etc. from water. It also improves the clarity of water by removing fine suspended impurities. 7. Silver Impregnated Post Carbon Filter: This helps to enhance the taste and quality of water by removing volatile organic impurities. Livpure Pep Star is not equipped with a pre-filter, I highly recommend to install a pre-filter for longer filter life and prevent water wastage though the RO purification process. Livpure Pep Star RO water purifier can handle TDS (Total Dissolved Solids) up to 1500 ppm, technically this completely supports municipal or corporation water, however, bore well water can have TDS levels between 1000 to 2000 ppm. We advice you to buy an affordable TDS meter that can help you check water TDS levels before and after water purification, this also helps you in buying the right water purifier and check the water quality after purification. Check our top rated TDS meters in India here. Water flow rate is decent at 12 liters per hour even with the 7 stage purification system and has a maximum capacity of 75 liters per day. The RO membrane can handle 300 liters per day and the UV column has a capacity of 24 liters per hour. It is important to know that 100 liters of bore well water can yield an average over 60 liters of purified water. Design: Livpure Pep Star RO water purifier is ergonomically designed with neat and elegant finishes. The 7 liter water tank contributes to its tall design, the body is suited to be installed on the wall and isn’t flexible to be on the countertop. Livpure Pep Star is quite easy to use and it is equipped with basic indicators and alarms that buzz on UV failure or glow when the water tank is full. I would have preferred more intuitive options like and LCD screen to show filter status and more advanced bells and whistles given the fact that Livpure Pep Pep Star is priced over ₹ 16,000 (MRP). 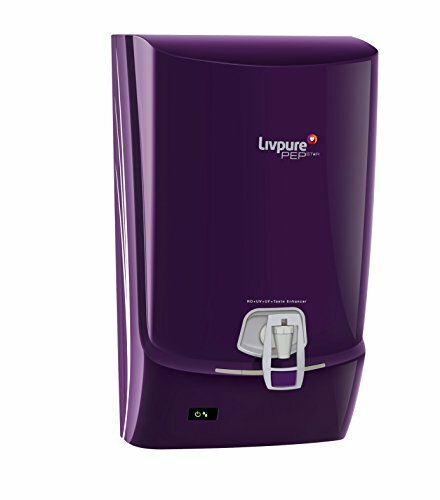 Service & Price: Livpure is relatively a new name in the water purifier market when you compare it to Aquaguard, Kent or Pureit brands. Livpure has a 365 day customer service hotline to answer or offer any product help. The product website is not updated with the store list (at the time of writing this post), the search results from the store locator states ” No Stores Found” this search was for prime metros in India, this really doesn’t sound good when a you are trying to sell a ₹ 20,000.00 product. However, Livpure promises two FREE onsite preventive maintenance visits during the warranty period of 12 months. Product service may not be an issue in major cities, but, you may need to find a good technician in other towns. Livpure offers annual maintenance contracts (AMC) starting at ₹ 4,999 that covers any breakdowns and replacements of spares and filters for one year, you’ll find a lot of if’s and but’s in the contract clause, read between the lines before you sign up for the AMC. Conclusion: Livpure Touch Pep Star RO water purifier is ideal for homes with water sources from corporations or municipal water supply where TDS levels are below 1000 ppm. The water purifier is equipped with the 7 stage advanced water purification process and a taste enhancer, however, the plasticky water tap, lack of advanced alert system and inconsistent service response may not go well with potential buyers. Livpure Pep Star RO water purifier is retailing at ₹ 16,390.00 and is also available on Amazon.in from ₹ 13,999.00 with free installation and manufacturers warranty. Check out our top 10 rated water purifiers here..
Abilash explores new products & technology, researches all the best-selling products and consolidates customer reviews on Amazon to create his helpful gift guides and smart shopping guide options. Abilash grew up and went to school in Bengaluru, India. He has travelled over 35 countries consulting in the fashion and footwear industry. Subscribe for the Best Deals..! We respect your inbox and will not fill it with SPAM and will never share or sell your email address. Stay ahead on the Amazon Deals..!